I recently finished plying up a big spinning project. 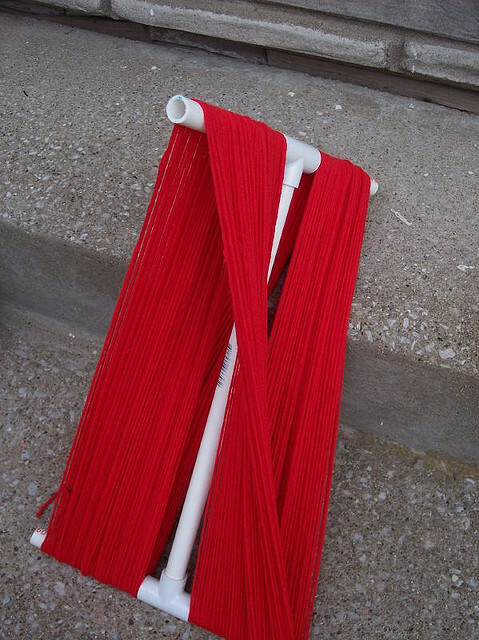 Now it's time to bust out the niddy noddy and start skeining. A niddy noddy is a very useful piece of equipment, but if you don't have one, you can still make do. Your arm works quite well as a makeshift niddy noddy. Just wind the singles from your elbow to the space between your thumb and index finger. Be sure to keep them under tension, so that they don't get tangled. And don't wind them too tight, because it will get uncomfortable the more you wind on there. The problem with doing it this way is that it's hard to tie the singles properly. You want to use 3-4 figure 8 ties on a fresh skein, otherwise it will become a tangled mess when you wash it. (Ask me how I know.) With an arm skein, you are forced to either slide it off your arm before tying it (big mistake), or try to knot the yarn ties with only one hand (huge pain). A better option is to use a sheet of cardboard. Make sure it's a thick piece (so it won't buckle), and make sure it's at least 30 inches long (so the skeins are long enough). Amazon boxes work well for this, especially if you fold them in half and wind the singles around a double thickness. Everyone always says you can wind singles off around the back of a chair, but I have NEVER gotten this to work. They always start slipping down, and then it becomes a big mess. YMMV! The best solution is to buy some cheap PVC pipe at the hardware store - you can even have them cut it for you - and make your own niddy noddy for only a few bucks. I still use my PVC niddy noddy from time to time, it works great! Here are details on how you can make your own PVC pipe niddy noddy.